Arriving in Bangkok Airport from my Qatar Airways flight from Doha, I went straight to the THAI Royal Silk Lounge in the E Concourse and then transferred to the THAI Royal Orchid Lounge opposite which have nap rooms. I was able to sleep a bit, took a shower and around 8:20am, headed to the Singapore Air Silverkris Lounge. I've read on the internet that seats 11A and 11K are the best seats since they have an extra storage space in a form of a bassinet. Upon arriving in the lounge, I kindly asked the agents if 11A was available as it was blocked during on line check-in. They confirmed it was and immediately booked the seat for me although I was told I need to get the new boarding pass in the gate. Around 8:50am, I left the lounge for the departure gate. Boarding started at 9:17am beginning with those passengers flying in business class and those with status. The business class cabin is in a 1-2-1 configuration with a total of 36 seats. The window seats in row 11 are both closer to the aisle while the middle seats are farther to the aisle. 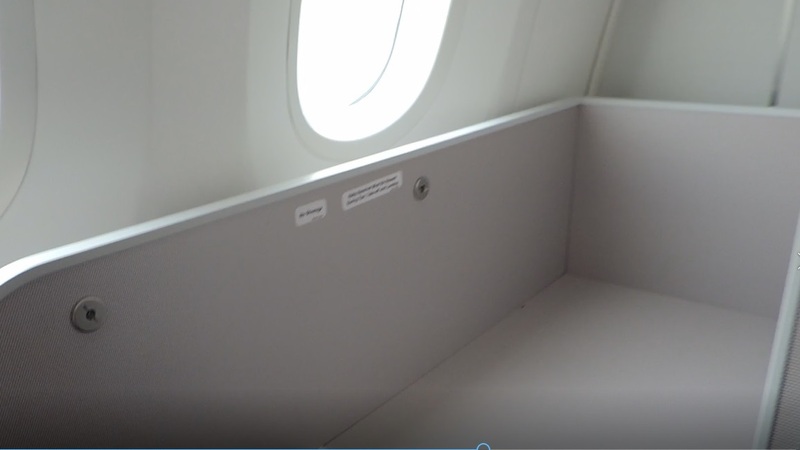 The window seats in row 12 on the other hand have the window seats farther to the aisle (but closer to the window) and the middle seats closer to the aisle. The seats in row 14 have the same lay out as row 11, with this lay out alternating until row 20, the last row. Because of the (smaller) size of the Dreamliner, the seats here were also narrower, unlike of course that of Qatar Airways herring bone configuration 😉 Already waiting at my seat was a nice pillow and a blanket. The 3-point seatbelt system (shoulder harness) reminded me of the one THAI uses on their A380 business class seat which I personally don't like much. 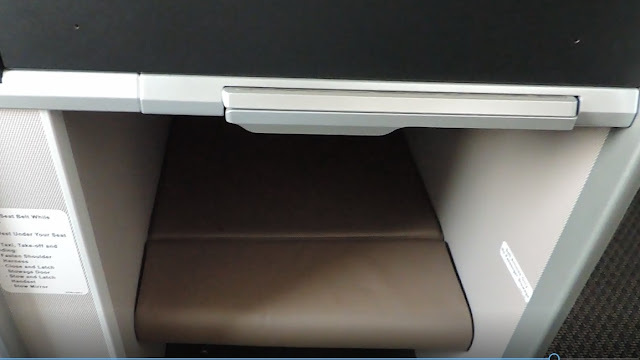 As you can see, the right armrest is really narrow. From the movie selection, I ended up watching "The Dark Knight". the headphones plus two USB charging ports and one power port. There is also a hook for the headphones. 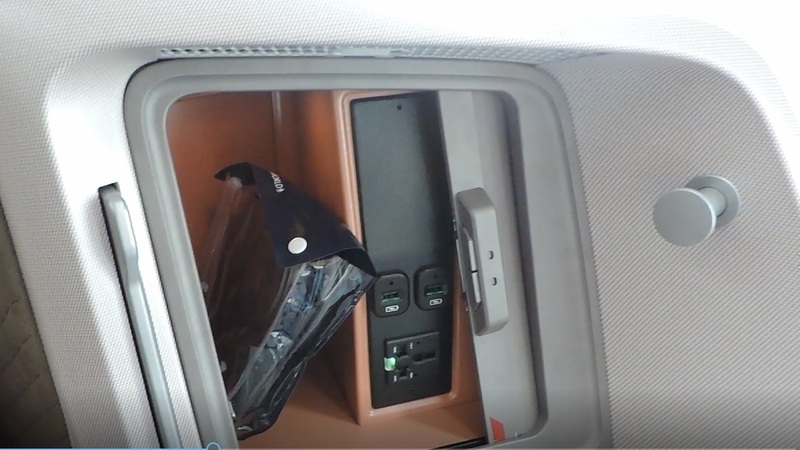 Headphones jack (pretty much like the ones on Etihad A380 First Apartment), light and seat controls and IFE controller. 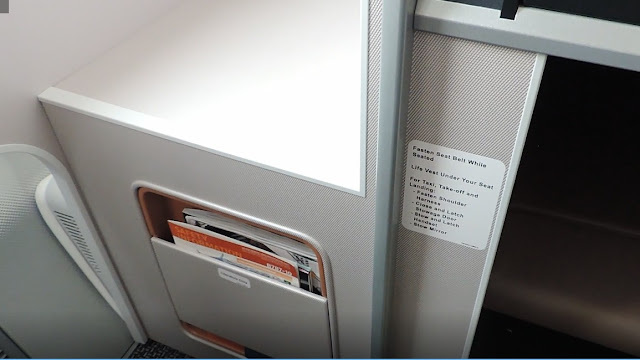 As this is a regional business class seat (to be used on Osaka and Perth flights among others) the seats are fully flat beds 👍 This is definitely a huge improvement to their old regional business class seats, like the one we flew on to Perth a few years ago. 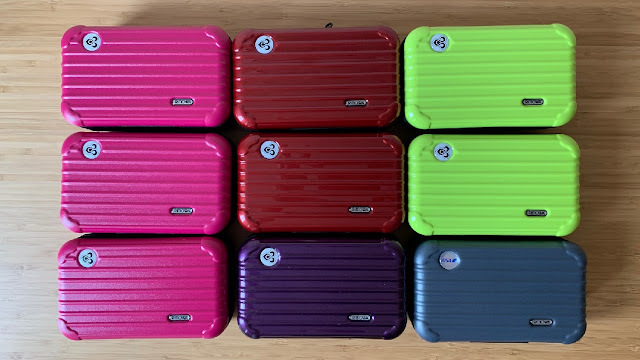 You get an extra storage where you can keep your bag or other things handy during the flight. As for the rest of the seats in the cabin, you have a narrower foot cubby and the extra storage is missing so make sure you book these seats especially on longer flights. Moments after settling in (around 9:22am), I was offered some newspapers but I declined. I was also offered some predeparture beverage and opted for a glass of water. Then, a hot towel was offered, followed by the immigration forms. Around 9:36am, the captain came on the PA to welcome us onboard and to give some flight information including our flight time of 1 hour and 55 minutes. Four minutes later, the NEWish inflight safety video was played on the screen. Pushback followed and around 9:56am, we had our take off. The service was a bit interesting as the crew actually started serving the passengers seating on the right aisle of the cabin which were seats 11F and 11K, all the way to row 20 then, from row 20 on the left aisle going up to row 11 (making me the last passenger to receive the meal). It could be that there were only few passengers so they decided to use only one trolley but still, it was a very slow process. Unfortunately, there was no menu card although the meal choices were seafood noodles or selection of dumplings and I chose the former. It was already 10:17am when I received my meal although it was worth the wait as it was phenomenal 😋 I also had green tea and apple juice for my drinks. To end the meal service, hot towels and a bottle of mineral water were offered. I thought the lavatory was spacious. Around 12:15pm, the captain was back on the PA to inform us that we'd be starting our descent soon with the current temperature of 32 degrees and an expected arrival time of 12:50pm. We landed around 12:49pm and reached our gate in Terminal 2 nine minutes later.